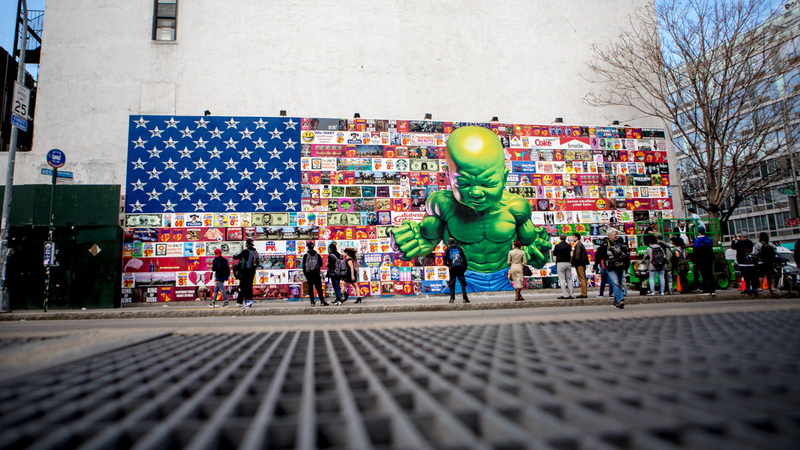 Ron English mural on the Houston Bowery Wall in New York City, completed 18 April 2015. Photo by Aymann Ismail/ANIMALNewYork. Bucky Turco at ANIMALNewYork reports on a large US flag mural by “interventionist” Ron English that’s gone up on the Houston Bowery Wall (an outdoor exhibition space) in Manhattan. The stars feature star-eyed (or rather star-eye-socketed) skulls, and the stripes are reproductions of English’s Propaganda images of ad and currency parodies. The baby Hulk in the middle?